When Jake Gyllenhaal trains for a role, the results are nothing short of outstanding. Discover how he shaped up to portray a world-champion boxer in the summer blockbuster "Southpaw." You probably first saw him in 2001's "Donnie Darko" as the dorky kid who was forever being badgered by a creepy-looking six-foot rabbit. Looking back at that movie, it would have been tough to predict Jake Gyllenhaal would become an actor in anything other than quirky cult films. But Jake has a knack for reinventing himself with challenging parts. He followed up "Donnie Darko" with the 2005 box-office hit "Brokeback Mountain," then quickly moved into his first physically demanding role in the Gulf War drama "Jarhead." That was the start of action-hero-style roles that demanded incredible physical transformations. Five years he later portrayed a super-stacked swashbuckling swordsman in "Prince of Persia." It was at this point Hollywood really took notice of his impressive physique. But his athleticism shouldn't be surprising. When you're someone who counts cyclist Lance Armstrong and actor Matthew McConaughey as close friends, like the 34-year-old actor does, it's not a huge jump to assume you're an active guy. 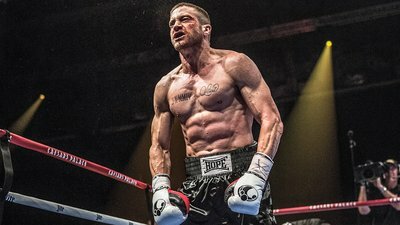 While it might not have been apparent in some of his films—like when he played the role of a malnourished, creepy-looking cameraman in "Nightcrawler"—Jake's fit physique is front-and-center when he plays a boxer in his upcoming movie "Southpaw." This latest role sees Gyllenhaal as a world-champion brawler at the height of his fame who falls on hard times, has everything stripped from him, and then fights to get his daughter back. "Train" sat down with Gyllenhaal to get a feel for the kind of training he did to get in ridiculously ripped shape and become a master of the transformation. Introduce his workout secrets to your routine to KO body fat and get down to your fighting weight before the final bell! Any sport where the object of the game is to batter your opposition in the face until he submits is something that cannot be done with anything less than 100 percent intensity. We asked Jake how much of himself he had to throw into this role and how far he was willing to go to get it right. All the way was the only possible answer. "'Southpaw' was one hell of a commitment," Jake bellows with a laugh that gives the impression it was more intense than he'd first imagined. "The preparation physically and internally, even the shooting schedule, was intense. Psychologically, it was a very interesting journey. I hadn't really boxed a lot in my life, and I think there have been some extraordinary movies that have been made around boxing, so I knew that the bar was already really high. "Thankfully the director, Antoine Fuqua, saw it the way I did. Honestly, I just trained like a boxer for five months. We shot the fights in the first two weeks of the movie, so I trained basically for five months up until those fights—we shot four fights in a row over roughly two weeks. But I basically trained how a professional boxer would train. "I went into full training-camp mode and I got myself—what I consider in my mind as an actor—in shape to fight. I was literally learning the skills of boxing, which is not only for the body, but also for the mind. You can't play a boxer and just look like a boxer; you have to believe you can exist in that world." "Honestly, I just trained like a boxer for five months. We shot the fights in the first two weeks of the movie, so I trained basically for five months up until those fights—we shot four fights in a row over roughly two weeks. But I basically trained how a professional boxer would train." The combination of a clear end goal and a competitive mindset is a key to success for all sportsmen, and it's definitely one Gyllenhaal harnessed. To understand this mindset yourself, start by imagining yourself in a boxing ring. The announcer calls your name to the crowd, and then calls your opponent's. It would be easy to get anxious, angry, or unsure, suggesting that half the battle is mental. The take-away point here is that if you can regularly practice and go on to master all these elements before any kind of competition, be it running races or soccer matches, you'll train your brain to help make your body come out a winner. There was no shortage of commitment from Jake to try and make this the most believable portrayal of a world-champion boxer on the big screen. To do this, he trained with the world's best. "The whole process was amazing for an actor, to get into the mind and physicality and core of [a champion boxer]," he explains with a deep furrow crossing his brow. "I was training twice a day in the boxing ring, seven days a week a lot of the time. I watched so many fights live as well. I watched Floyd Mayweather's and Manny Pacquiao's fights. I trained at Floyd's gym in Vegas, various gyms in LA, and also in New York at Church Gym with real fighters. "I was sparring and really getting hit. It helped me understand the sacrifice it takes to be a fighter. But it was so important that we shot those fight sequences first, because I was in that mindset. I was used to being hit and punched, and I knew how to move with my body aching. It would have been incredibly hard to sustain that for a full 40-day shoot." Gyllenhaal is clearly no tourist: he mucked in, got punched, and came away with a new respect for the grit needed to enter a boxing ring. To get in shape for the role, Jake religiously followed a fighter's training camp, which is how professionals shape up before a bout. "Over the course of the day, I would literally spend six hours training," he reveals. "I made a deal with my trainer, Terry Claybon, that if I was going to learn how to box, I was going to have to get in there and act like a boxer. I wouldn't have wanted it any other way. It was tiring but invigorating and incredibly inspiring." Gyllenhaal's typical day included an 8-mile run first thing the morning, followed by sparring, followed by a 30-minute rest break and a bodyweight and core workout. Try it on for size! When it came to boxing training, Jake knew it was important to constantly push himself as he became fitter. "I did timed rounds of exercises, gradually increasing time as I improved," he says. "I started with jumping rope to increase my coordination, quickness, endurance, agility, and footwork speed. I then shadow boxed to warm up and get my rotations loose. I'd follow that up with 6 rounds of the heavy bag, 3-4 rounds of speedball, and 4-6 rounds of pads. Together, they helped improve my strength endurance, power, coordination, technique, and footwork. All rounds ran anywhere between 2-5 minutes depending on the day and what we were training. It was incredibly gruelling, but a lot of fun because we were constantly mixing things up." When asked about the energy-system demands, Jake says, "Boxing training is often 80 percent anaerobic and 20 percent aerobic. To be a better athlete in general, you need these things, but as a boxer it's imperative: strength, power, speed, agility, and quickness." Though boxing is a sport that demands extreme physical fitness, it also requires a lot of power. This creates a tricky balancing act between getting strong and muscular, but also incredibly fit. "Strength-wise, other than the boxing training, my workouts were very compound and bodyweight based, so there were a lot of dips, pulls-ups, walking lunges, shrugs, deadlifts, crunches and squats," explains Jake. "It was more calisthenics-type stuff and compound moves. It was all about functionality, although I did do some weight-based workouts—typical moves like bench press and shoulder press for strength and to add a bit of muscle mass." Try this workout using the exercises as recommended by Gyllenhaal, which he used to gain lean muscle mass. Different sports create unique muscular aesthetics, and boxing is no exception. "The weight training was a very small part of the workouts," Jake explains. "It was mostly in the ring. I would do a ton of roadwork and running-machine work as well. "Then I would also do sprints, skips, foot-speed drills, and box jumps. The development of the character was massively physical, so getting in shape and learning how to box and the mentality of that discipline was immensely rewarding. "There's a responsibility in telling a story. There's a responsibility to know your own mind, and then when it came down to doing the physical stuff, you didn't even think about it because there was so much adrenaline going on and the prep was so thorough." With the physique Gyllenhaal is sporting, it's not difficult to see the clear payoffs for all the hard yards. Hard training is nothing without a solid nutritional foundation, and Jake is quick to point this out. "My look really came from my diet," he says. "Nutritionally, it was 6-7 meals a day, eating every three hours or so—often to both fuel for my next session and to get my energy back up from the previous session," (Gyllenhaal) says. "Nutritionally, it was 6-7 meals a day, eating every three hours or so—often to both fuel for my next session and to get my energy back up from the previous session," he says. "My diet would consist of lots of eggs, chicken, fish, bananas, apples, almonds, cacao beans, raisins, goji berries, rye bread, pasta, couscous and potatoes, and lots of steamed vegetables and salad: avocado, tomatoes, broccoli, and other dark-green leaves. Nothing was fried, and everything was as natural as possible. I would drink plenty of water throughout the day, as well. "In terms of supplements, there was vitamin D3 and vitamin C, and then also protein shakes." Ready to get ripped for the ring and into fighting shape? Follow Gyllenhaal's mental, physical, and nutritional advice to strip down to succeed at your own weigh-in!